Crate training a puppy is the quickest and easiest way to keep your home a 'puddle-and-pile-free' zone! This method teaches a pup to eliminate where you want him to, while at the same time minimizing the number of accidents he has. You might be wondering exactly why using a crate is so great, and may even feel that you don't want to put your precious baby in a 'cage'... but there's no need to worry! 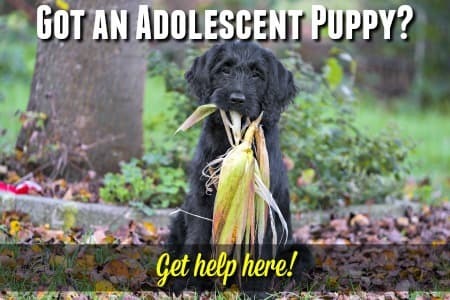 I have all the information you need to understand not just how it works, but why your puppy will soon enjoy being in his crate and why that's completely natural for him. A dog crate is truly an amazingly versatile piece of equipment and it's not just an effective puppy housebreaking tool, and as dogs are naturally 'den' animals, your little guy - or gal - will feel safe and secure in his crate. As he gets older he'll actually enjoy being in his own cozy, safe little hideaway and will often choose to go there for naps, to chew on his favorite toy, or to get away from the noise/fuss of visitors etc. 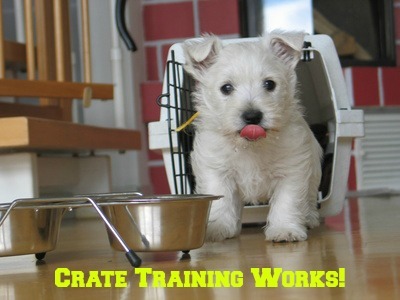 A crate can be used to house train an adult dog just as easily as it can with a puppy. In fact, potty training an older dog this way is sometimes even easier because of their much-improved bladder/bowel control! There are many different styles of crate to choose from, but some are better suited to puppies who are being housebroken than others! Check out my Choosing The Best Dog Crate page to find out more. Your puppy will most likely not have spent much time in a crate before he comes to live with you (except perhaps during travel, or if his breeder started him on housebreaking) so crate training will be new to him. The main reason why crate training a puppy is so effective is that it taps into your pup's natural desire to keep his 'den' clean. In the wild, puppies would toddle out of their den to eliminate - even if it's only two tiny puppy-sized steps outside! This is instinctive behavior and is hard-wired into their little brains. Now, your little guy has never seen a real 'den', but being in his crate will trigger that deep-seated instinct and he'll naturally do his very best not to pee or poop until you let him out. Although crate training a puppy will help make housebreaking much easier for you both, your puppy is a baby and has other natural instincts to deal with too. One of them is that he instinctively wants to be right next to his pack - and that pack is now YOU. He feels anxious and worried if he's away from you (because in the wild a puppy who gets separated is vulnerable and in great danger). 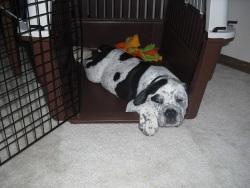 This is why he will cry and complain and fuss and whine at first.... not because he hates his crate! Of course, he's perfectly safe... he just doesn't know it yet. And as he's a domesticated dog and not a lone wolf, he needs to get used to being separated from you from short periods, so it's okay to ignore the fussing. When you're crate training, it makes the whole process a bit easier if you let your pup get used to his new crate, and feel comfortable around it, before he has to spend much time actually inside it. Something worth mentioning here is that you should never use the crate as punishment. Your pup needs to think of his crate as a safe, happy place where he gets the chance to chew on his very favorite toys! Putting him in his crate as a punishment or when you're angry with him will undo all the hard work you invested in the first place. When you begin crate training your puppy, leave the crate door open and throw some really tasty treats inside, all the way to the back. Curiosity will get the better of your little fur ball sooner or later and he'll venture inside to claim them. Give Fido his meals inside the crate (with the door open). This way he learns to associate one of his favorite things (food!) with his crate. If he seems scared at first try feeding him right outside the crate door a couple of times then try it inside again. Make crate training fun by playing this game. Put a tasty treat or special toy inside his crate and then encourage your pup to 'find' it. Using a happy, friendly voice say something along the lines of "where's your goodie? Let's find it?". Follow the search with praise, such as "Oh, there it is. It's in your crate (or bed, house whatever you want to call it). What a good boy, you found it!" Now you know all the benefits of using a crate to housebreak your puppy, and how to handle the introductions, you'll need a straightforward guide to how to actually use it! One of the reasons for crate training a puppy is that it helps to keep him safe - but there are a few things you need to do to make sure he stays that way. Don't ever leave a chain, prong, training or slip collar on little Fido when you put him in his crate. It's quite possible it could get caught up on something and then he'll panic, the result of that could be tragic. If you really must leave a collar on make sure it's a simple, undecorated buckle collar - or even better a safety 'break-away' type collar. Don't leave your puppy crated in a hot room, in sunlight (even indoors) or outside in direct sun, or in a car on a sunny day. 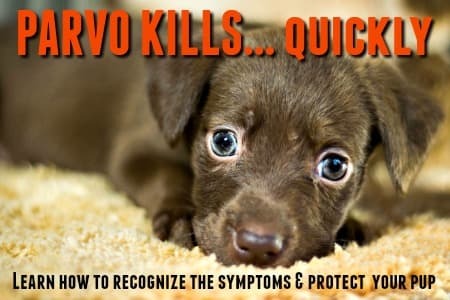 It doesn't take much for a puppy or dog to overheat, and again the results could be tragic. When you're crate training a puppy in hot weather, be especially careful with short nosed breeds (otherwise known as brachycephalic breeds) as they tend to have more difficulty with the heat. Something similar applies to heavy, thick-coated breeds such as Shetland Sheepdogs, Husky's etc. Never allow children to tease Fido while he's in his crate or push their fingers through the doors or wire panels. A puppy or dog who is crated, can tend to feel cornered if approached or teased. Even an even-tempered, docile dog can react with growling or snapping if he feels threatened. His crate is meant to be your puppy's safe haven, and as such he has a right to some peace and quiet and to feel safe when he's inside. I love the '...For Dummies' series of dog training books, and have several of them on my bookshelves. This is another one that hits the spot! The very words 'house-training' can strike fear into the heart of puppy owners everywhere! But you won't need to panic if you have this book in your own, personal collection. Written with a good dose of humor, this house-training handbook is packed with practical tips and information to help you tackle the challenges of house-training with confidence. It's designed to get your puppy eliminating where you want him to - whether that's outdoors or inside on pee pee pads or some other indoor potty option. Whether you're a newbie, or an experienced puppy parent...if you have a puppy, you need this book! You'll can also find more puppy training (and dog training) books on my Dog Training Books page. A good book is worth it's weight in gold.